Potentilla, the scientific name of the genus tormentil belongs to, derives from the Latin word “Potentia” which means power. 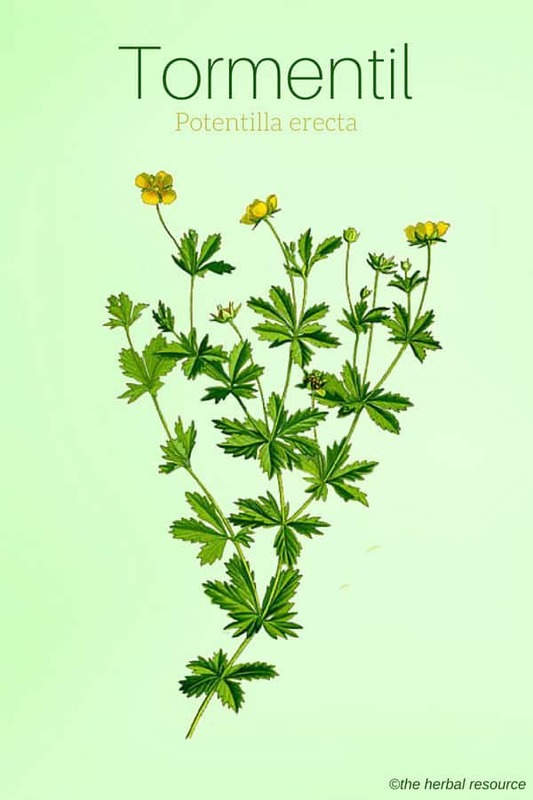 Other Common Names: Septfoil, bloodroot, erect cinquefoil, shepherd’s knot, tormentilla (Spanish), Aufrechtes Fingerkraut (German), potentille dressée (French), tepperot (Norwegian), blodrot (Swedish), blóðmura (Icelandic), rätvänä (Finnish), blodrød (Danish). N.B. One of tormentil’s common English name “bloodroot”, is also the name of a completely different plant, the American species Sanguinaria canadensis. This plant belongs to different plant family and has other medicinal properties. Habitat: Tormentil grows wild predominantly in Europe, West Siberia, Asia Minor and Newfoundland. The plant grows on lean, sandy, light acid soils in dry habitats, such as mountains, meadows, bogs, dunes, fens, heaths and open woods. Description: Tormentil is a 10 to 30 cm high, perennial, herbaceous plant that belongs to the rose family (Rosaceae). The stems are slender, procumbent or erect, and richly branched. The short rhizome is thick, hard, and blackish externally but brownish red internally. The shiny, dark green leaves are alternate and consist of three obovate leaflets with serrate margins. Each flower stalk produces one single yellow flower at the tip. The flower has four petals (rare in the rose family) that form a cross-like shape. The plant is in bloom from August to September and it produces 2 to 8 inedible fruits. Tormentil is hermaphrodite (male and female organs on the same plant) and it is pollinated by bees, beetles and various insects belonging to the order Lepidoptera e.g. butterflies and moths. Plant Parts Used: It is the rootstock (rhizome) that is used medicinally. The rhizomes are dug up in early spring or late fall. The small root runners (stolons) are removed before the rhizomes are cleaned and dried for later use in powder form or as a tincture. Active Ingredients and Substances: The rhizome contains reddish, alcohol-soluble and water-insoluble phenolic substances known as phlobaphenes. They can be extracted from the root and used as dye called tormentil red which has bactericidal properties. Furthermore, the rhizome contains 10-25% tannins mainly of a catechin nature, saponin (tormentoside), the triterpene alcohol tormentol, some essential oil, resin, and plant acids. Tormentil has been known for its medicinal properties for centuries. In European herbal books from the early medieval period, the rhizome is referred to as Rhizoma tormentillae (tormentum = pain). In the past, the plant was attributed almost magical abilities as a remedy for all kinds of conditions causing pain. In the late Middle Ages, the herb was highly recommended in the fight against the plague. This use was probably also linked to the doctrine of signatures that states that herbs resembling different parts of the body can be used to treat ailments afflicting these body parts. 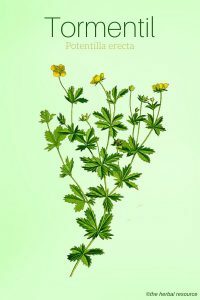 The cross form of the four petals of the flower (most plants in the genus Potentilla have five) was regarded as a sign of the strong force of the plant, and the red color of the rhizome was thought to be an indicator of its effectiveness as a remedy for all ailments associated with the blood. 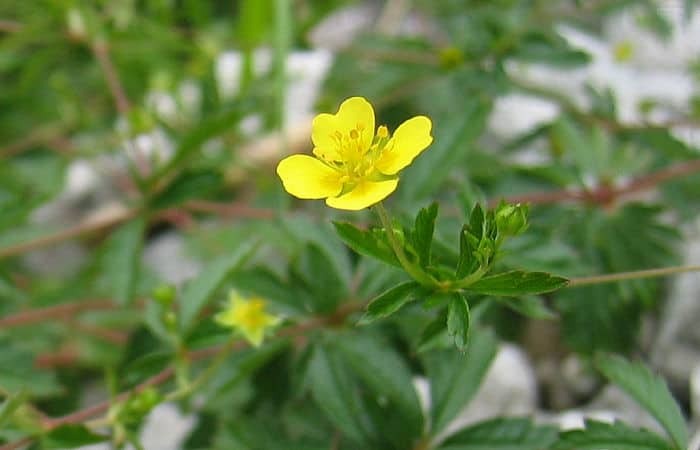 Today, tormentil is mostly used in herbal medicine for its astringent properties owing to its high content of tannins which is very rare for an herbaceous plant. The herb is used internally for both acute and chronic diarrhea, dysentery, gastroenteritis (inflammation of the stomach and intestines), enterocolitis (inflammation of both the small intestine and the colon) and to halt minor internal bleeding. The herb is regarded to be particularly useful for alternating constipation and diarrhea (shifting pattern of constipation and diarrhea) due to the antiseptic properties of the phlobaphenes (tormentil red). In addition, the herb has been used as an herbal remedy for the inflammatory bowel diseases (IBD) ulcerative colitis and also for gastritis and peptic ulcers (open sores that develop on the inside lining of the stomach). Externally, tormentil is used in the form of a gargle as a treatment for inflammation of the mucous membranes in the mouth and throat. It is thought to be useful in treating conditions, such as pharyngitis (swelling in the back of the throat between the tonsils and the voice box), laryngitis (inflammation of the voice box or vocal cords), mouth ulcers, tonsillitis, and bleeding gums. As a relief for hemorrhoids, the tormentil root can be added to bathwater or sitz baths or used in the form of an ointment applied directly on the affected area. The herb has also been used traditionally, in the form of an ointment, poultice or compresses, as a natural treatment for wound, cuts, burns, eczema, and rashes. In folk medicine, a weak decoction was prepared with the rhizome for treating conjunctivitis. As tea: Boil 1-3 tablespoons of the chopped tormentil root in half a liter of water for 15 minutes. A cup of the tea can be drunk several times a day between meals. This concoction can also be used as a gargle or added to bathwater or sitz bath. The tea has a rather distasteful flavor, to say the least, but can be improved upon by adding peppermint, chamomile or lemon balm to it. These herbs are also good for the digestion, among other things. As a tincture: Place finely chopped root in alcohol (40%) for 4-6 weeks, stored in a warm place. Shake the mixture daily and finally filter. If the tincture is intended as a gargle, the dosage is 10-20 drops in half a glass of water. Tormentil has a strong drying action, and can at high doses easily irritate the gastric mucosa. As an ointment: Wash and shred the root. Let it simmer for 10-20 minutes in an equal weight of olive oil and allow it to pull overnight. Then heat the mass to a liquid state and sieve it through a cloth. Add a bit of beeswax and wait until the wax melts, stir and allow it to cool down until the ointment solidifies. No side effect or interactions with conventional medications or other medicinal herbs are known when tormentil is used properly and in moderation. The herb can cause stomach problems in excessive doses and in sensitive individuals. Ingestion of large doses can also cause constipation.